Unfortunately, puggles are prone to reverse sneezing. It doesn’t happen to Preston very often but when it does, it is hard for Mommy and Daddy to watch. Here is what mommy usually does when Preston is having an episode and it seems to help. Wow, that is interesting. CoCo has done this before…maybe once or twice in the almost two years that we’ve had her. CoCo’s episodes usually last about 1 minute and I’ve thought nothing of it. Now I know. Thank you for the information and short lesson. Preston is so good in letting Mommy help him. I hope it doesn’t happen too often. Mugsy does this, too! Especially in the middle of the night, when she is sleeping under the covers! Ruby does this too…freaked me out the first time. Good tips, I’ll have try it when it happens again. Which I know it will! I do this too! I always wondered what it was. Now I know, reverse sneezing! Brilliant. Thanks for the info Preston. OMG, I used to do that for a couple of years but I’ve suddenly stopped! Mom never knew what it was. She’d always race for the water dish to offer me and then she’d hug me! Thanks for letting us know what it was after all this time, Preston! possibly helping all Preston Brah’s cousins out there. I don’t think any of us have done this before,. We usually blow it out, HARD! Till it sprinkles all over mommy’s face. Hehehe! But my kitty sista does this everyday & when she gets stressed. Mommy always thought she has asthma but she is a healthy black cat. She doesn’t have a squashed in face either. She’s just like any other normal cats. That’s so great that you posted this up, because John & I have been so concerned when Max does this. He’s been doing the reverse sneezing a lot lately and we were gonna ask the vet about it. What a coincidence that you posted this topic up today. Genius! thx so much. I’m so glad you posted this and to see other people and dogs comment… I read about this on our pug adoption site before getting my 2 rescues, but my old family pug never did it. Sophie hasn’t ever, but Dixie did, so I was glad that I had read about it first. Thanks for showing us how you make Preston feel better, I’m sure it will help Dixie in the future!!! Sparky’s mama here: I’m glad you posted about this, because it’s happened quite a few times to Sparky, and it always leaves me feeling like a failure because I can’t assist him. The one thing I’ve noticed is that it usually happens when he’s just been out of his kennel – is excited – and outside. I hold him like you do, but I’ve never tried covering his nose. The look of his belly is totally frightening, so it’s good to know that this is somewhat common and not harmful to him. Hello Preston ~ This happens to me a couple of times a week. You sound just like me. My mommy squeezes my nasal passages together and then gives me a big hug and it goes away. She thinks its because of all the sniffing I do. I am sorry this happens to you too. Our Mom thought it was allergies when we did this, but wasn’t sure EXACTLY what it was. Thank you so much for the info. It makes her feel better !!!! Kisses ALWAYS help us too !!! This happened to me yesterday after my day in the day care. My mommy gave me a benadryl, but this demo helps tremendously. She will know what to do. It’s very uncomfortable, huh? Hope we won’t have too many of them. I’m was just about to search google to see if I could find out what this weezing that PJ does every so often, but I thought I’d check out Preston’s blog first since I hadn’t been there in awhile and wanted that recipe for frozen treats. Lucky for me, the first posting was exactly what I was looking for. Honestly, you have a great blog here. 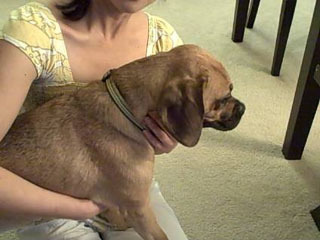 The day I found myself owning a puggle by surprise last August, I found this website and it’s been a real treasure. Now I actually want PJ have a ‘reverse sneeze’ so i can try out your technique. Oh my goodness, thanks so much for posting this!! Clover does the same thing – it scares me every time it happens. I figured it was a pug/brachycephalic thing, but I never thought to look it up! You are so smart and helpful, Preston’s mommy!! We will definitely try out your technique next time. Hey! My dog does that too, ive found giving him something to drink works well. I have a water filter that spits out strawberry flavor that makes him WANT water. yeah it stops the episodes fairly fast. I was scared the first time but my mom is the one that asked the vet about it. This happends to me once in a while. Thanks for the awsome tips. 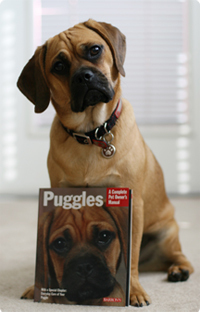 Minnie our puggle does this, too! The vet said she really need to see an episode in order to diagnose it…..Well, now we know. I’ll try the helpful hints on Minnie and see if it works.